The guards camp was along Schlesierstraße. Today, some barracks serve as St Pius' kindergarten, the Lutheran parish centre and as residential buildings. The POW camp (map) itself was further in the north. 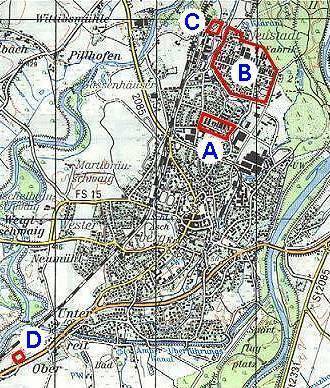 The main street running from west to east is Sudetenlandstraße where only few original barracks still exist. Private houses, shops and workshops were later built in the area - as well as St Pius' Church and the Stalag memorial fountain. Stalag VII A had its own railway station (map) connecting the camp to the railway line from Munich to Ratisbon. Stalag railway station (see above). The POW cemetery was south of Moosburg at Oberreit (at the federal road B11 to Freising). After the war, the POWs' bodies were transferred to other cemeteries. Today, the site is the Stalag memorial. Last update 10 July 2000 by © WebTeam Moosburg (E-Mail) - All rights reserved!